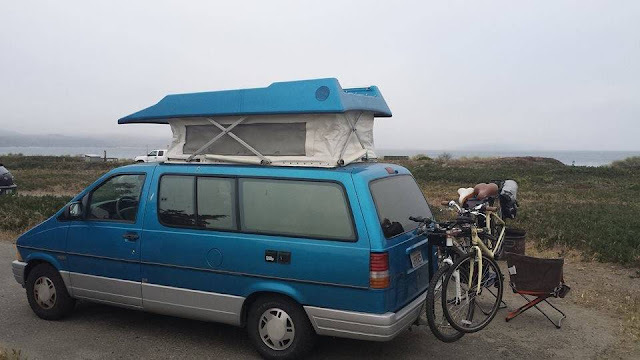 Who wants an all-wheel-drive camper with a pop-up top that isn't some giant gas guzzling motorhome or a really expensive Mercedes...or a Volkswagen Van? Yeah. Anybody who doesn't want to be confused for the next bearded hipster with a fat wallet and this next car won't have you confused with anybody who might have ever had a reliable paycheck. 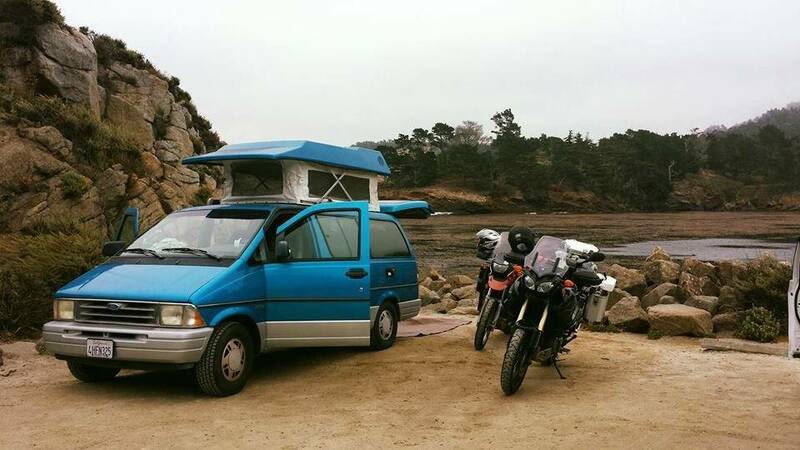 Find this 1995 Ford Aerostar Camper offered for $16,275 in Santa Cruz, CA via craigslist. Tip from Rock On! Meet "Jupiter5", the 1995 "Country Homes Camper" Ford Aerostar pop-top camper van! This is a one-of-a kind, extremely rare, 4WD camper van in excellent condition. Price is fair and firm, I am not making money on this sale, just breaking even at a very fair price. This van is much more reliable and has more features than a VW Eurovan/Westy, and those are going for $30-$40k!! 128,7xx miles, brand new pop-top seal and tent hinge bearing, clean title, no accidents, excellent condition, V6 w/ 17 city/23 hwy mpg, automatic transmission, automatic 4-wheel-drive, professional conversion, officially an "RV", passenger captain's swivel seat, couch-to-bed, pop-top tent with windows/screens, front-load 2.1 cubic foot refrigerator powered by camping battery or 110v shore, 2-burner propane stove & RV-installed propane tank w/gauge, sink w/ water pump (battery or 110v), 8 gallon clean water tank (fill from outside), 110v hook-ups, inside outlet, overhead and reading lights, custom cabinets with lots of storage, flip-out small table/counter, camping battery charges by van alternator or 110v shore & has gauge, 'Shady Boy' awning, bluetooth stereo and new front dash speakers & hands-free mic for phone calls, cold A/C & heat in front and back of van, insulated & carpeted. Everything works, no upcoming maintenance, recently fully inspected, well loved. Conversion done by professional company "Country Homes Campers" no longer in business, but the owner is still available to talk to, and he has online store with spare parts. The conversion and custom interior cost the original owners over $15k - - just for the conversion alone, not counting the van itself!! Simply adding the pop-top would cost you about $6k-7k without anything else. The owners also wanted custom cabinets and a custom interior layout, which added additional costs. This van is one of a kind, verified by the owner of Country Homes, whom I talked to several times after buying this van (he's awesome). Automatic 4-wheel drive: Automatic 4WD is a full-time system that lets the vehicle operate in 2WD (either front or rear) until the system judges that 4WD is needed. It then automatically routes power to all four wheels, varying the ratio between front and rear axles as necessary. No manual switching needed. I have driven on some very gnarly roads with total confidence due to this 4WD, where I would have otherwise gotten stuck for sure. Automatic transmission V6. Dropped the pan for a transmission check and fluid change June 2018 and everything looks great, I have paperwork. All maintenance paperwork has been kept for you to review. Extremely reliable, never any issues at all mechanically or RV parts - everything works with minor glitches detailed below. Tires in great condition, you might want to add different tires with beefy tread depending on your 4WD use. Extremely reliable rock solid engine with many more miles to go. Never any signs of oil/fluid leaks. I had a full mechanical inspection done in June 2018, paperwork saved, no issues. Gas milage: 17 city/23 highway. I was always happy with this! For a 1995, the paint and body are in excellent condition. There is a very tiny dent under the right rear taillight that is hardly noticeable, you can see it in the picture with the yellow kayak. No accidents. Please be aware: If you're driving up a huge hill and it's really, really hot out, the engine tends to go to the warmer side but never was in a danger zone, however I was concerned (only on one occasion) and if you plan to do a lot of desert camping, you might consider adding a fan to the engine. Also, I never had any problems with the brakes except for one time when I was going down a huge summit with a tiny winding road that requires a LOT of braking, and I noticed that the brakes were getting hot, so I stopped periodically to cool them and had no problems. Other than that one time, I never had any issues at all with engine or brakes overheating. There is a switch in the engine which will jump start your van/engine battery with the camping battery if needed. Air lift rear airbags in case you are carrying a heavier load, you can pump up the rear and lift the suspension. I think one of the air bags needs fixing, and I never had a need for this, so never fixed. The rear ABS light on the dash comes on sometimes. I've had this checked by my mechanic, who has assured me that the brakes are fine and that the Aerostars and known for having some issues with the dash warnings. He said it would be a big expense to fix the dash light, so I decided to leave as is. One-inch crack in windshield, I sealed it years ago and it has never spread at all, left as-is. Tiny (smaller than a quarter) tear in headliner, front cabin. New pop-top seal and hinge bearing done 1/19/19 - $475 What do I mean by the hinge bearing? Imagine a pair of scissors opening and closing. The blades of the scissors are in a cross shape which pivot around a fulcrum, just like the hinge opens and closes the pop-top tent. The fulcrum of the hinge has a bearing which connects the "scissors" to the van, and it runs along a slide as it opens and closes. Originally this "bearing" / fulcrum point was made of plastic and is known to break over time. I went ahead and replaced it with the metal version (machined and sold by County Homes Campers). Manual pop-up, tent in very good condition, there are a couple VERY minor tears and dis-coloring but zero issues. Replacement tent available on CHC website if you ever wanted to buy a spare. Tent has zipper windows with screens to let the light in and keep the bugs out. Do the dishes in front of your ocean view! Technically this is an RV, which means you can buy it with an RV loan. RV loans can usually be stretched out for much longer and are easier to get. Plus, I think DMV registration fees are cheaper, not sure but worth checking on. External 110v outlet to plug the camper into power at a campground, there is also an outlet inside of van, so you can plug in appliances when you have shore power (such as a heater), otherwise use the battery bank to power the fridge and sink pump and lights. The camping battery charges via the van alternator (or when on 110v), so that you will have a full charge when you arrive at your campsite, and more than enough power for the lights, sink pump, and fridge (2-4 days on the fridge depending on use). Has built in battery gauge. Battery recently tested and looks good. Sink with pump and 8 gallon fresh water tank, you can also connect to city water just like a normal RV where you connect the hose to the outside of van. Sink works but handle to control amount of water flow does not, needs replacement, but you can use the sink just fine without the faucet, just control on/off with pump. No gray water tank, because it is just clean water from the stove that is being dumped. There is a hose hook-up to carry the used sink water away from the van or into a container if desired. From the sink, you can open the side van window and there is a very long hose which you can pump water from and take an outside shower or rinse off your surfboard/snorkeling/scuba gear. 2 burner propane stove, large propane tank, (8 gallons I think, will check) lasts forever! I did a ton of camping and cooking and only filled the tank once! Tank recently filled and ready to go for you. The propane tank is professionally installed, RV spec'd with gauge, under van. Easy to fill at any gas station with propane. 2.1 cubic foot refrigerator runs off battery (or when plugged in to 110v), front loader, works perfectly. I keep it around level 2 and food is plenty cool for 2 full two days. It's well insulated so you can turn the fridge down or off at night to save battery power. Shady Boy awning installed, manual pull out, works great, but it is very difficult to pack back into the awning fixture! Passenger captain full swivel chair, both seats are extremely comfortable and have air-filled electric adjustable lumbar support. Back seat folds out into a bed in about 1 minute, you just pull out the seat and screw the 2 leg posts onto the bench and pull out to a bed. Fits 2 people snug and 1 person very comfy. You can use the kitchen with the bed made out. You could add a top bunk - Westy style, there is a design to add a "top floor/shelf style". Black out curtains all the way around, snap into place on interior, in great condition, all matching fabric. My kayak fits completely inside if I swivel the passenger seat, or if there is a passenger, just hang it out the back a bit and bungee hatch down. Easy stealth camping with the top down, stay at Yosemite for free! * New sink or fix the handle which I think just has corrosion. Sinks works fine so I never bothered to fix it, turn on the pump and water comes out, turn off the pump and it stops, no problem. * Add solar! I never needed it but if you're off-grid for a long time you'll want it. There's a nice kit on Amazon. * A couple of random times I was unable to open the side door with the handle, and so I just opened it from the inside. Since I never could replicate the issue and it only happened a handful of times, and it was hardly an inconvenience, I kept it as-is. * The foam for the bed was always good enough for me, but my partner used a thermarest on top of it for extra cushion. We always thought it would nice to get thicker foam and add custom fabric. I dearly love this van, it's funny how attached I got to a vehicle. I searched for over a year and 1/2 for this van. I wanted a Westy but was concerned about reliability. I finally came across County Home Campers and looked for one, but they are rare and very hard to find. If you do find one, I'm 99% sure it won't be a 4WD in excellent condition with relatively low miles and so well loved! I hope that you could copy and paste that ad Vince. That is a hell of a lot of typing to do for a Ford Aerostar. When he told me I was going to be living in a van down by the river I had no idea it was going to be this nice! I used to threaten my son with that for not doing his school work...maybe I didn't think my plan all the way through. This whole Van Life thing. You could sleep in a tent and have 16k left over for plane tickets and AirBnBs. I'm starting to think you could put a rooftop tent on a rusty Oldsmobile Firenza and get $15k for it.